This debut novel follows a young mountain climber’s unconventional quest for enlightenment. The story introduces readers to Donato, a young man with a mission. After a thunderegg (a sort of geode) falls from a tree on the same day he fails to save a young calf’s life, Donato vows to find the place where souls go when they vanish. The calf’s soul “didn’t go down, it didn’t go sidewise, and it didn’t go into outer space, but it did go up.” In search of this mysterious up, Donato travels the world, first as a student, then as a Navy SEAL, then as a sculptor. His journey takes him from Oregon’s Cascade Range to Mount Bundok in the Philippines to the Dolomite Mountains outside Padua, Italy, and then back to the American Northwest. Many years and many mountains later, he is still looking for answers: “Up seemed just as elusive and intangible as ever, and I wondered if I would ever find it.” Ultimately, he does discover it, and in exactly the place where he least expected to. Among the curious characters readers meet along the way are the hero’s parents, lovable eccentrics Yango and Clotho, who tell young Donato about the mystical Nagah sheep, a bighorn who climbed down a fissure in a mountain and emerged as the North Star. Nagah serves as a sort of governing spirit for the story, an otherworldly but ultimately benevolent lodestar. Mulch writes about Donato’s search in a whimsical, absurdist style with plenty of jokes and fierce exaggerations (stones that float, an anthropomorphic tree frog, and a wise Elf who makes killer veggie burgers all appear in Chapter 15, and that chapter is not an outlier). 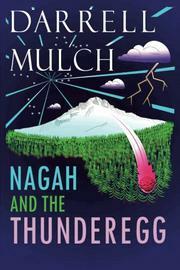 Mulch operates here very much in the tradition of the American tall tale; there is no blue ox in the book, but there could have been. A grumpy social satire peppers portions of the tale’s second half—the author laments the yuppification of Portland, Oregon, at length. Some readers may find the jokes here underdeveloped and the satire a bit too vague but most should smile throughout this unusual adventure. A witty, Rabelaisian road story about one man’s search for what matters.